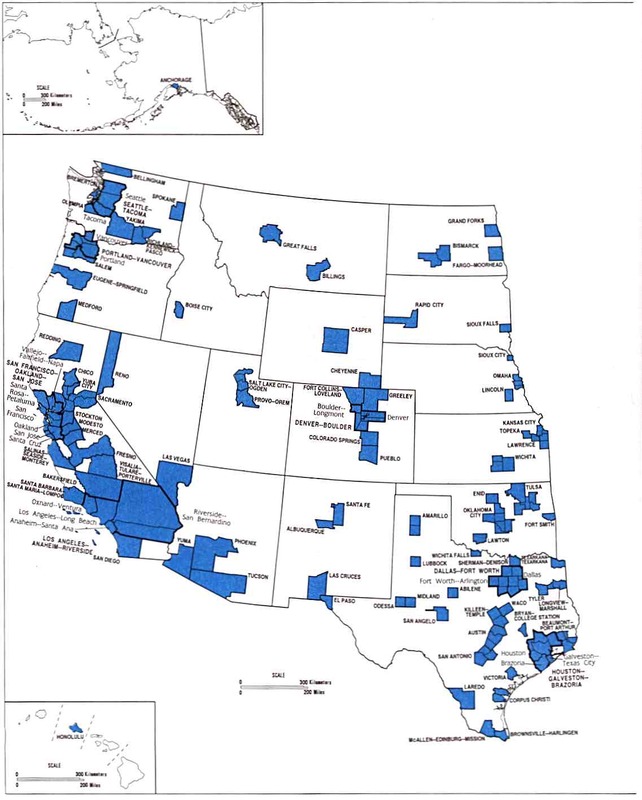 Headwaters Economics, a non-profit organization focused on issues pertaining to the American West, divides that region into three types of counties. Blue indicates Metropolitan Counties. This is where the cities are. (And note that the West is the most urbanized region in the country; there's a ton of rural land in the West, but hardly anyone lives out there. For instance, more than 80% of the population of Arizona lives in either the Phoenix or Tucson Metropolitan Statistical Areas.) These areas are characterized by high rates of growth, in terms of population, income, and (at least until recently) jobs. People here are more educated, more of them work in service and manufacturing, and there is less dependence on non-labor sources of income (e.g., Social Security). Yellow areas are Connected Counties. They don't skew very much towards either the young or the old. They grew slowly in the 1980s, but have grown more quickly since 1990. People here tend to be somewhat more educated, and jobs have been shifting from agriculture and natural resources towards the service sector, with the highest income areas concentrated around airports. The gray areas, Isolated Counties, are older, less educated, and have slower population growth. Jobs are concentrated in agriculture and natural resources, but incomes are lower and there's more dependence on non-labor sources of income. Headwaters also has an interactive map that lets you see demographic and economic date for individual counties. How are they defining metropolitan? Because Imperial County should be gray, not blue. I'm guessing they consider it part of the San Diego Metropolitan area. Or maybe they consider El Centro a sufficiently bustling metropolis to give Imperial the Metro designation. They seem to have a slightly more generous definition of 'metropolitan' than, e.g., this map. Folks, we used the Census' definition. If you are interested in the peer-reviewed article with our methods (J. of Rural Studies) see http://www.headwaterseconomics.org/3wests/Rasker_et_al_%202009_Three_Wests.pdf This article was accepted by the journal and will come out late summer.